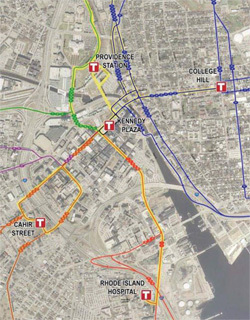 The Federal Transportation Administration announced who is receiving $290 million in TIGER funds for “Urban Circulator/Bus and Bus Livability Projects.” Rhode Island is among the recipients with $700,000 going to RIPTA to develop bus hubs outside the Downcity core. The Sub-hubs, as we’ve been calling them here, are a recommendation of the Metro Transit Study. With new smaller hubs, taking the bus will take less time. Extending RIPTA bus routes beyond the primary downtown destination of Kennedy Plaza to other hubs just outside of downtown will eliminate the need for many passengers to transfer to reach their final destinations. In this plan, RIPTA will develop new hub locations in the West Side, College Hill, Capitol Hill and the Hospital District areas. These will attract riders because trips will be more convenient, accessible, and highly visible in new key locations. Additionally, dispers- ing waiting buses to these new hubs will help the reinvention of Kennedy Plaza by decreasing its congestion. The Metro Transit Study estimates that it will cost $5,454,000 to complete all hubs, located on the West Side, College Hill, Providence Station, and near the hospitals. However Phase 1, which includes bare-bones amenities at the West Side and College Hill Sub-hubs and through-routing of buses to these hubs is estimated to cost just $200,000. RIPTA will begin Phase 1 by continuing to develop the first such hub located on Cahir Street on the West Side of Providence near three Providence High Schools. This hub will include amenities such as new bus shelters, map and schedule information, bike racks, and in the long term real-time arrival information, public art to relate it to its local neighborhood, and new branding of bus service. Phase 1 will also include extending the 49, 52 and 90 routes to the West Side and providing a similar hub on College Hill as part of the extension of routes 55 and 66. The real-time arrival information is part of RIPTA’s Intelligent Transportation System (ITS) which will allow RIPTA to feed information about where buses are to bus stops, mobile devices and more. The ITS is currently under development. Of course all of this will be for naught if the state does not do something to address RIPTA’s funding problems. I thought the ‘Intelligent Transportation System’ (ITS) planned to be implemented this year. Is it being pushed back? Any idea or where can I find the timeline? I’m just wondering as in the article it’s designated as ‘Long Term’. My understanding is that RIPTA has funding for the equipment (perhaps has equipment on order or in hand, I’m not sure). And they have hired someone to manage the ITS. ITS will then be rolled out for internal use, so that RIPTA can track its own assets. This may be the “this year” part of the implementation. As they get the system set internally, then they will work on real time information at bus stops and online for public information. That is why the ITS is long term at the hubs. Also, I think the hubs are looking to be done 2013-ish. So long term is probably like 24-36 months, not many years. Of course as with everything, RIPTA’s plans, and RIPTA’s funding are two very different things at this point. They could use the $700,000. to keep some of the buses running, why take all day service on holidays away, just mix it up take some times off of every bus route so that everyone can visit there friends and family on the Holidays Think first before doing. There are more buses than anyone can count coming and going from southside, Pawtucket and the Westside its allways been a wonder of mine why so many Buses being waisted going to Problem areas of the State. People Whom Work or Senior Citizens take The Bus for Shopping or Coming and going to a Senior Centers Stop making it easy for drug runners and Stop acting like School Buses taking kids to and from school is the reponsibility of the school system not RIPTA so many Students on some buses leave no room for Workers and Seniors, Some seniors can’t walk to far or as good as a younger student can. Um, there are so many buses coming from these so-called problem areas because that’s where the most demand is. That’s how transit works. In areas where there are the most riders, they have the most buses. Those areas are the most densely populated and tend to have the largest population without cars. I don’t know how school buses work around here. So I won’t comment on that, but consider that in Manhattan, school kids ride the MTA buses and subway, not school buses. This may not be Manhattan, but why add additional school buses when there are already RIPTA buses going where the students need to go? Excellent point about density and people served, though this should be obvious to everyone. The Manhattan parallel used to apply to Providence when school kids were given bus tokens. Do they get RIPTA cards today or is there a separate bus system for the school department? As Jef pointed out in a previous piece “Could the schools help provide needed transit for Downtown?” Providence already has 4 transit systems when the college bus systems are accounted for. Other than issues like integrating union and non-union drivers and combining management between public and private organizations, it might be worth more serious consideration to study how these duplicative transit operations might be combined into one system to enhance service for all. Another point about densely populated areas is that they often the places that contain the highest number of rental dwellings. Many of the people who rent those apartments have lower incomes and therefore may rely more heavily on transit due to the significant costs of owning and operating a private passenger car. Affluent suburbanites live in regions where houses are widely dispersed and to varying degrees a car is a necessity. The kind of transit that may makes more sense for these areas might be bus or train service more geared to commuters traveling to employment destinations, which could be in suburban office and industrial areas as well as in the city. Anyone know where the picture/map came from and is there a legible version? The map is from the Metro Transit Study. I have noticed that LED signs have been installed on some buses where the “Stop Requested” sign is typically located. Right now, they scroll the current date and time and indicate “Stop Requested” when the cord is pulled. Is this part of the Intelligent Transportation System? I asked RIPTA and the answer is yes. Those LED signs will be used to list upcoming stops (part of ADA compliance), when the ITS system is fully operational. Thanks Jef. I also noticed that RIPTA has begun installing cameras on their buses. I noticed 2 cameras mounted near the front entrance next to one of the rear view mirrors; one pointed out the windshield and one pointed toward the passengers. Looks like slowly but surely, new features of the Intelligent Transit System are being rolled out, I was on a #99 bus yesterday that had the automated announcement of the major stops as well as having the stop names show on the LED signs. I would hope that eventually all stops, not just the major ones, would be automatically announced and shown, but given all the talk about reducing the number of stops, I can see why this may not be practical right now. I should also mention that the transfer bus stops and routes are also announced and displayed on the LED sign, which is helpful. Example – Smith and Canal Streets – Transfer to the 51, 58, 72, etc.